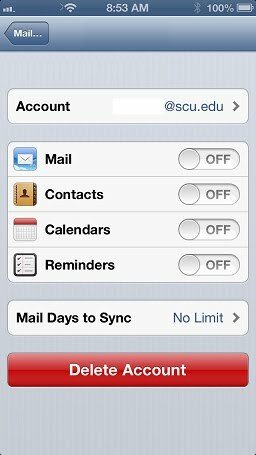 Once the campus email system has been migrated to Google (on December 14th, 2012), the existing Groupwise account on your mobile device will no longer synchronize your email, calendar and contact entries. In order to continue synchronizing your email, calendar and contacts, you will need to create a Google account on your mobile device by following the appropriate instructions for your device. 3. Near the top of the page, select your NotifyLink account. As it was named by you when creating your account, the account name may vary. It's usually called "GroupWise". It should say "Mail, Contacts, Calendars" in small print below the account name.